When Monique invited me to join her 10 day series, I considered sharing ten days of handwriting tips, after all, that's a skill I often share with homeschool friends. But I wanted this to be more personal than just instructions. So, this is the first of my ten-days of sharing how our family incorporates homeschool with so many aspects of our life. Hopefully these tips I'll be sharing over the next ten days are things you will benefit from, too. In case you are visiting for the first time, and because I have not done so in a while, I'm sharing a bit about us today. For much of my career I worked two to four jobs, some part time, but together way more than one full time job at a time. I didn't start out wanting that, but opportunities opened as needed. About ten years into our marriage, my husband and I decided to leave the city where we had lived our entire married life and move to my family's farm. To say our lives changed drastically is a massive understatement. At that time, we changed from both of us working away from home to just one, but I was the one. We moved back home with my parents while my husband built our dream home. And then we both worked away from home, and then later switched again to me being home with the kids while my husband worked. By profession, I am an Occupational Therapist. My husband is a mechanic. If you ask me, I'll tell you that he can do anything. I'm a homeschool mom, and for years we juggled our schedules and shuffled our kids to accommodating friends and family when neither of us could be home with them. We tried online lessons and DVD school and workbooks they could pack in backpacks more easily as we shuffled them around. I can tell you how, with a lot of help, homeschooling while both parents work IS possible. But for us, our plans changed. Staying home isn't easy. Twenty years of working means some strong habits were set--time alone in the car and running errands on the way home, extra money to spend, you get the picture. Job changes meant lifestyle changes has to be made. There is no doubt in my mind, home is where I belong. That doesn't mean it's the decision you should make. That's up to you, just like for twenty years working outside of the home was the right decision for me and my family at the time. This isn't going to be about convincing you to do what we did but instead sharing our unique circumstances. Time with my children is precious. They grow so fast! Our oldest daughter has already graduated, our middle child/youngest daughter is a senior this year, and our son is starting eighth grade. The youngest two have been homeschooled since kindergarten. We've changed plans often and still do. One thing that has stayed constant is that homeschooling for us blends in with everything else in our life. For the next two weeks I'll share more details about how that works. 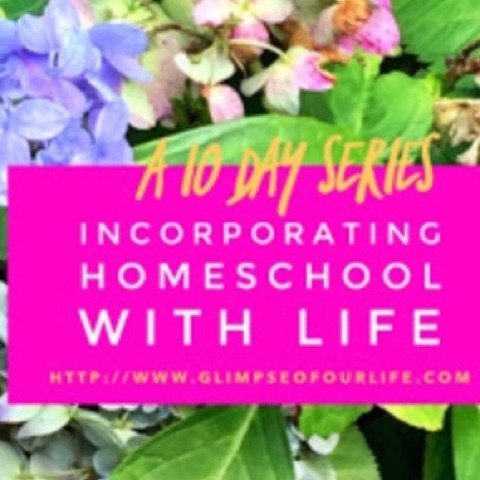 Click on my "life school" tag below this post for the entire series as well as the links to other bloggers joining this 10 day journey. Hi Jennifer! I'm planning to homeschool my 4 year old son. Actually we're on a planning stage already, making some home changes to accomodate a study/play area for our son. He's diagnosed with Autism and Speech Delay. Now, I'm based outside the US and therapies aren't accessible through government fund. I'm still fortunate though that resources are everywhere on the Internet and that's where I get the ideas and techniques which suits best for my son. More and more resources are available online now, though so much can be learned from a direct therapy consultation. I met a speech therapist who wrote programs specifically designed for parents who homeschool to use with their children at home. I hope you find exactly what you need to help you provide just what your son needs. Thank you for the insight. I thought about homeschooling myself, but I don't think it's the right move for us as a family. It's always good to have options! God bless you, Jennifer.